Exam rooms and dentists' surgeries have a tendency to make most of us feel a little anxious. But if we brush our teeth on a regular basis and go for regular checks, there is little to fear from the dentist. And the same holds true with that exam-room experience - but only if we have brushed up on our revision technique and prepared ourselves as best we can, leaving little to chance. Getting started is the difficult bit for most and many of us could win prizes for avoiding things we don't want to do - parents too. So you are no different from anyone else if you are stuck with revision-time blues and anxious about exams - but here is how you could make a difference and get better results. Ten minutes is all that it takes whenever you get stuck. Ditch those four-hour sessions you had planned, in which only 10 minutes' actual work is done. Start with the 10 minutes you know you will do. Then have a 10-minute break and start again. Anyone can do that. So can you. When working, work, and when relaxing relax. The two don't mix. Remember that. No texting friends, looking out of the window or playing with the cat. And your room can wait for another few years to be tidied. So now you have started, doubled the time you normally work in an evening and had a 10-minute break, all within the first half hour. Increase the working periods to 30 or 40 minutes and keep the breaks at 10 or less. Sorted? Well "ish" at least. Don't think about it, just do it - now! Congratulate yourself for having done it. You've made a start. Staring into space won't help but the "10-minute rule" will whenever you have difficulty in starting something you don't want to do. Ease in an extra half hour of work a day at least, by getting up earlier or taking less time over lunch. Over five days that will give you a minimum of two-and-a-half hours of quality study time. You could now have an evening out. Cover two or three subjects in the one session. Start with the one you dislike most and then look forward to finishing with the one you like best. Check your equipment, make sure that it is in good working order, and know what is to be provided by your school. Check you do not have two exams at the same time. Special arrangements need to be made. Do not cheat or break any rules. You could be disqualified or even arrested. Mobile phones are a menace and barred from the exam room. Don't take one in. You could be disqualified. Do not cram the night before an exam. Have a leisurely breakfast or lunch and walk to school, if possible. Be there in good time. Avoid friends outside the exam room. They could confuse you. Keep your thoughts to yourself and concentrate on the exam. That's why you are there. Take six deep breaths and have a glucose sweet, to boost energy to your brain - but don't crunch! Choose questions carefully and write notes on the question paper to help you remember later. Make sure you answer the question asked. No marks if you don't. If you run out of time, more marks can be gained by completing your remaining answers in outline only. State what you would do and how to do it, by outlining your main arguments in an essay - without writing the essay - and by jotting down formulae in science - stating how you would complete the question - without doing the calculations. 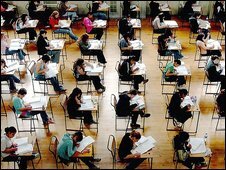 Do not worry about the exam you have just taken - you can't do anything about it now. Concentrate instead on the next one, where you can make a difference. Put old exam papers in a drawer and forget them. Being calm and thoughtful will help you to get the most out of your preparation. But it is up to you now to make a difference in how your perform - no one else to blame if you don't do as well as you could. And remember: the only place success comes before work is in the dictionary. Go to www.ofqual.gov.uk/examsdoctor and pick up a copy of our student guides or e-mail me at examsdoctor@ofqual.gov.uk for a personal answer to your question.